Hello friends, my name is Read Aloud Dad and I am an addict. And I am talking about a strange addiction here. You must all know there was a period last year when my addiction was out of control. Yet, please understand, I was powerless to fight the urge. After tasting something as pure as heaven, my will-power collapsed in a single day. What I was about to do - had to remain a secret. No one knew that I did it, I never even told my closest friends and family. One night last year - after succumbing to temptation, I did something I never did before. I bought all (available) books penned by Robert McCloskey. With just one click. My addiction to McCloskey's pure and distilled love for children was fuelled with the first three Robert McCloskey picture books that we already had in our home. After being blown away by his timeless picture book troika (Make Way for Ducklings, Blueberries for Sal and One Morning in Maine), I convinced myself that McCloskey could do no wrong. I wished all his books were here. So one October evening, a bored worker at Amazon's warehouse had the strange task of preparing and shipping "a Robert McCloskey package" that contained one copy of Robert McCloskey's Burt Dow, Deep-Water Man, Lentil, Homer Price, Centerburg Tales: More Adventures of Homer Price and Time of Wonder. The warehouse worker packing the books was probably yawning at that moment, but I? Was I happy? No, I was ecstatic! And yet I had absolutely no idea what I was getting. I just knew I was about to receive a box full of McCloskeys. Did I know that Burt Dow, Deep-Water Man was a good book when I bought it? No. I simply had to have it. b. Seemed too wordy for my 3-year olds. c. Maybe a bit passé? e. I predicted they would stand only the first two pages before jumping up from their seats. I resigned myself to a probable defeat. OK, Read Aloud Dad - you win some, you lose some. Clearly, I acted rashly when I ordered all those books. This book gathered dust for a couple of months on our bookshelf, until finally I decided it was time to change our standard McCloskey fare. I brought out Burt Dow one evening with low expectations and then ... out of the blue.. my 3-year old kids amazed me. They listened to the curious story of Burt Dow, his two old boats, his sister Leela that keeps the house for him and Burt's unlikely pet - a giggling gull. They hanged to every word about old Burt Dow pumping water out of his old dory, the problems he had to start up the old engine and how his fishing trip was initially unsuccessful. Nothing really dramatic happens in the first 25 pages of the book, and yet I did notice that my twins were listening carefully. We stopped reading at the mid-point as they were getting a bit restless, so we agreed to finish the book the next day. I thought realistically there would be no tomorrow for Burt Dow. Yet, 24 hours later my little pumpkins keenly continued and we read together about Burt Dow's fascinating encounter with a whale that swallowed him and his old dory .. all together with the giggling gull. And how Burt and the gull found an ingenious way to get out. My two listeners wanted to read the story until the very end ... and we finished the 64-page book in two days. That's it! We made it. I was happy that the book served its role at least once. We would probably come back to it after several months, but this would be no favorite of theirs - I was sure. The next time when we came back to Burt Dow, Deep-Water Man - surprise, surprise! My kids were snickering like mad at the name of his old boat the Tidley-Idley! And the giggling gull caught their fancy. We had a non-stop reading session - the whole book in one read. They were laughing like crazy at the gull. They kept repeating "Tidley-Idley, Tidley-Idley! 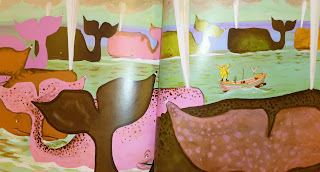 And they were silent as a pair of church mice, while we were reading the part when Burt Dow encountered the whale. Their eyes were wide open. Their lips were apart. They were absorbing the fantastic vocabulary. And this time - I knew I had to look a bit closer at what was really hapenning. There was something going on here that I was missing. My worries that this book would be less accessible to my boy and girl than their all-time favorites Make Way For Ducklings or Blueberries for Sal were completely unfounded. In fact, I surprised myself with how low my expectations were. 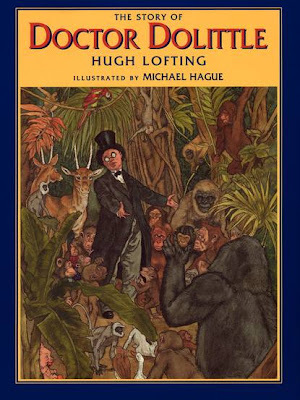 My kids enjoyed this book every single time that we read it, so much so that they could not take their eyes off it during any reading session. Was it the realistic tone of the story? 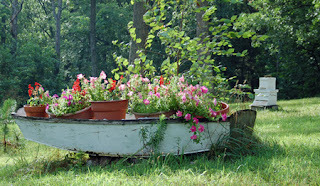 Or was is it the "grown-up" theme of an old man going out fishing in his old dory? Or was it just the pure distilled Robert McCloskey magic touch? Yet, what I know is that children's authors who treat their listeners as equals command a great respect in the hearts of my twins. My twins are children, of course, yet that does not mean that they accept to be treated as inferiors. And this is the greatest lesson that Robert McCloskey shares with us. He understands that being young does not automatically beget unequal treatment. Young or old, we are all equals. Why can't a good children's story be demanding, involving, multi-layered - yet based in everyday, real life? Children do not wish only to hear fairy tales or simplified stories tailored for kids. Kids also love such books that give them a taste of pure interaction between humans and nature. Our family celebrates Robert McCloskey as one of the greatest teachers of the finest things in life. Burt Dow, Deep-Water Man is a testament to something that is lost in modern times. A pure love of living .... coupled with a deep breath of fresh sea air in your lungs. You have been properly warned of the risk. I know exactly what you feel! Isn't it exciting when one finds more treasures from a favorite author! It is such a pleasure to sail on "McCloskey Ocean", I hope you enjoy the trip! These books connect me again with the pure, pure innocence of youth. I thought I was a fan too, until I found all those great "extra" books that I did not know about! Yes, Burt Dow is a lovely read-aloud, a bit more complex than Make Way for Ducklings and Blueberries for Sal - but a genuine McCloskey, for sure! Hope you enjoy the read when you come across it. Holy cow! I thought I was a Robert McCloskey fan, but now I can see I don't deserve the title since I had never heard of Burt Dow. So great to know about! Yes, his illustrations are perfect for impressionable young minds. It is interesting how his illustrations evolved during his career. I was surprised how how black and white drawings evolved into beautiful watercolors in later books. Just proves what a great genius McCloskey was! You are a most honorable fellow member of McCloskey Anonymous! My experience has been that McCloskey is especially well suited for slow, long days... his books are then like a sweet cherry on a cake! Maybe you can surprise your kids with a McCloskey - when they least expected. Who knows, maybe they surprise you? Greetings, It's Valarie from Jump into A Book. All I can say is that I keep very good company. I, too, am a McCloskey addict and did the very same thing you did. Congratulations on your big box of McCloskey and may you have many many happy read aloud moments. I love that Burt Dow boat!! Thanks for sharing your inspired moments of clicking and receiving. Enjoyed the post so very much. Thanks for "jumping in" and for your very warm words! I am so happy to have a fellow McCloskey addict - it will make our McCloskey Anonymous meetings so much more fun! Thank you for your wishes of many happy read aloud moments - I really am looking forward to hitchhiking with my twins along the McCloskey trail for many years ahead. Adventures we will all remember forever! I'm so glad you did that. I love Robert McCloskey and only have 4 of his books, though my kids don't share my love of him (sadly!). This time, you made me smile! Thanks so much for your kind comment. I am glad you enjoyed Make Way for Ducklings, your 5-year old will certainly have a great time reading about Burt Dow's adventure with you! You are spot on. Lentil is fantastic and a very involving story. I love the way that he pictured the town of Alto ... you feel as if you are walking down its streets. McCloskey is a gem not to be missed, thanks for sharing your enthusiasm for his books! I also have a McCloskey illustrated book names "The Man Who Lost His Head" http://t.co/Iienifs , also great fun! Thanks for recommendation! Lentil is also a good read! I really enjoy McCloskey, why did I not realize he had written more than the three books my library stocks? You sir are an education. Thank you! Your posts always makes me smile. I love McCloskey, Make Way for Ducklings was a favorite of mine as a kid. Bu I have never read Burt Dow. I think will have to find it and read it with my 5 yr old. You warmed my heart. I am really happy that you enjoyed the post. Burt Dow is a book that unexpectedly came into our lives and that my kids truly adore. It has a tempo of its own and it is perfect for a slow day, when the whole family has time to sit down and enjoy a special read-aloud. Oh and I haven't started Homer Price yet! Now, I'm itching to take it out of the bookshelf! As soon as I post this comment, I'm taking Homer Price off the bookshelf to peek inside. This week it will be on our repertoire! Thank you so much for your comment and the feedback on Homer Price! This was a beautiful post! I don't think I've ever read Burt Dow, and now I'm inspired to go find it and read it with my kids. Have you started Homer Price yet? It is also highly addictive--another absolutely amazing read aloud.